I personally think that this is a great selection of products and for the prize of $46 (with $130 worth of products) you get amazing, high quality items that you can thoroughly enjoy using around the holidays and after! First, let’s talk about the Face Palette, shall we! 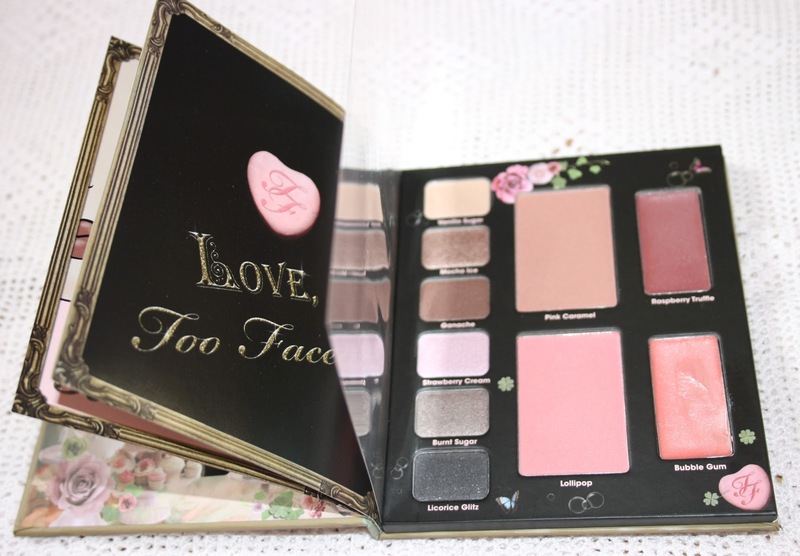 The palette is called “Love Sweet Love” and all products in it are named after sweets, which I think is well – sweet! :)) The six eye shadows are amazing, very creamy and pigmented and I definitely think that they are the same quality as the Too Faced core line eyeshadows (I know many brands lower down the quality of the products in the gift sets, but Too Faced absolutely didn’t). As far as the 6 eye shadow shades I think that they are the perfect basics colors and are great to have in your collection. You can create a pretty natural look, as well as a more dramatic, smoky one. The two blushes are nice, too. The pink one (Lollipop) is a nice baby pink color that has some fine golden shimmer in it. I love it! The Pink Caramel is the one thing in the whole set that I am not that crazy about. It has a nice brownish color that again, has fine golden shimmer in it. However, on my skin (I have pretty light skin) I can only wear it as a bronzer and even then it looks a little muddy on my face. But I reckon that for people who have darker skin tone it will look pretty. The lip glosses are two lovely shades – one is brown reddish color with (again) golden shimmer and the second one is a nice bubble gum pink with some fine shimmer in it. Both are great quality and really moisturizing, even though they’re not extremely pigmented, they give a nice tint to the lips. The staying power is average – they stay on for some good 3-4 hours. The LashGASM mascara is also really good. It does an amazing job at lengthening the lashes, but you really need to me extra careful when you apply it, since it has a little bit of a tricky wand and it may clump your lashes a bit. Then we have the Primed & Poreless Face Primer. On the package it says “Use alone for the look of flowless skin or under bronzer & makeup for a perfect finish”. Basically, since the primer has a nice tint to it, it really can be used on its own – it evens out the skin tone well enough. However, I am someone who always prefers to have more flawless looking skin, so what I do is apply the primer and then put on some of my favorite foundation. 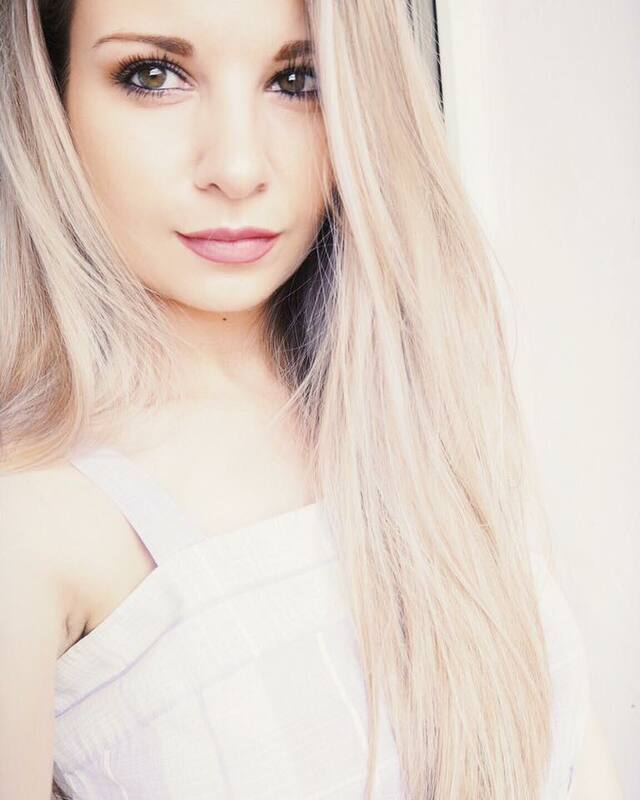 I love how the primer makes my skin really soft and smooth and kind of creates a “canvas” for my foundation. I end up having a poreless looking skin and also the primer makes my foundation lasts hours and hours. The set also comes with a brush and it is the Multi-Purpose Face Brush made with the famous Too Faced Teddy Bair Hair. It doesn’t only look super adorable, but it is also really soft. It doesn’t shed at all and I usually use it to apply my blush. It works incredibly! Oh wow, I know what I'm asking for for Christmas this year. :) Love you blog, just followed you! Thanks for the great post and swatches! The Mocha Ice is my favorite shadow color! I've heard their primed and poreless products are amazing! I definitely want to try those out. and the review is so informative . I love how pigmented that eye liner is, thanks for doing a review on this set as I've been looking everywhere for one! -New Post on Levi's Jeans up now! Great product choice! I love the palette! Great review! I love your blog! I really like Too Faced as a brand and am so glad they make sets like this! oh wow!! this is such a cute set! i really love the William Shakespeare quote inside. This looks like such a sweet set! Glad to hear that about the shadow insurance. My shadows tend to crease a lot and I've been looking for a solution, specifically looking into this one. Thanks for the review! I am siksha sinha . basically I am belongs in India but that time I stay in USA .i want some gifts and flowers .i am search on Google. Then I am found the phoolwala site .phoolwala is the very good online service provider By internet . I am happy use this phoolwala website .